Climate scientists’ theories, flawed as they are, ignore some fundamental data. One of the great scams they are pulling now is to pick out an isolated event, make up fake statistics, and assign it to climate change. After an historically quiet period of hurricane activity in the US, Sandy hit. Jeff Masters immediately made up some fake statistics about it, and now it is proof of climate change. After an historically quiet Atlantic hurricane season, Jeff Masters made up some fake statistics about Typhoon Yolanda, and it became proof of climate change. Same story with tornadoes in 2014. Climate alarmists know that they can lie as much as they want, and they will rewarded financially. Masters’ Weather Underground is named after a 1960’s terrorist organization. 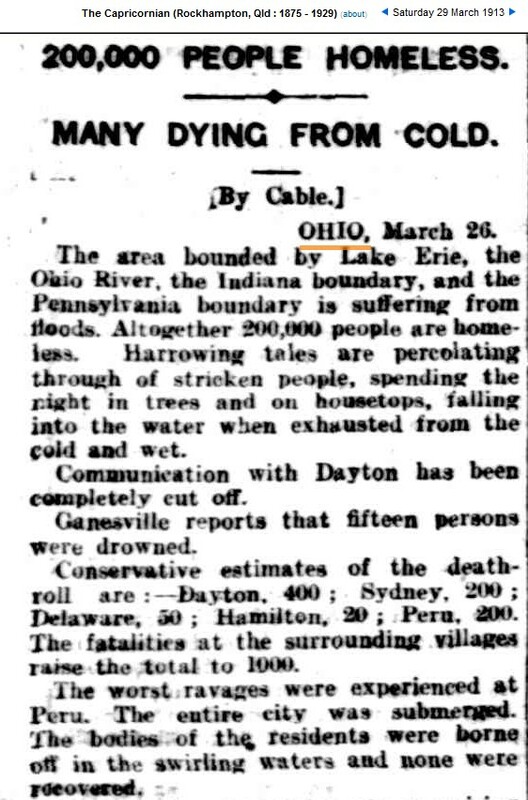 And Four Days Later …..
Four days after the Easter Sunday tornado of 1913 which killed 250 people, a massive flood in the Ohio River Valley killed 1,000 people and left 200,000 homeless. Climate experts who say that the weather is getting more extreme, are either completely incompetent, completely dishonest, or both. The real world says differently.